Alan Fraser's annual seminar at the Chava Shelav Feldenkrais Center (just east of Cologne) will be held September 21-23 in 2018. It is open to all musicians, not only pianists, and non-musician practitioners as well. The weekend explores how the principles of Feldenkrais can be applied in a performance situation for immediate improvement and transformation of one's sound and one's entire sense of musicianship. 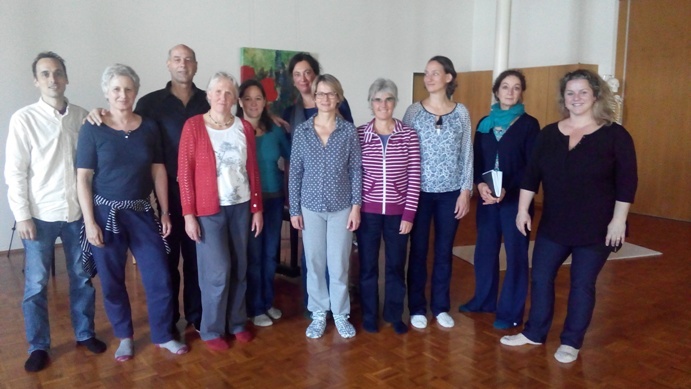 The three days alternate group Feldenkrais Awareness Through Movement lessons specially oriented towards the performance needs of musicians, with hands-on work by Professor Fraser at the piano or the person's instrument. This course has also been popular with Feldenkrais practitioners who may not play an instrument themselves, but who are seeking new, effective ways of working with musicians. Fraser teaches in English; translation into German is provided. Please go here to REGISTER FOR THE VUSSEM WORKSHOP. For more information please go to page 23 of this Feldenkraiszentrum Chava Shelav Kursprogramm brochure. The nearest train station is Mechernich, and it is a short taxi ride from there to the center in Vussem. The Feldenkrais Center has its own accommodation arrangements, in dormitory-style houses near the center. Contact the Feldenkrais Center for more details. There are a few eateries within walking distance of the center. Please contact the Feldenkrais Center for tuition rates and registration for this event. Follow this link for more on the Feldenkraiszentrum Chava Shelhav .